At Restaurant & Cafe Supplies we take pride in all our products made with reclaimed wood, which are both an environmentally and economically-friendly option. A reclaimed wood table top is sure to add character to your dining room without breaking the bank. Our reclaimed wood table tops are built to the size and shape that you need using wood salvaged from area buildings. A reclaimed wood table top makes any environment look stunning. The benefits of using reclaimed wood table tops are not only that you are making your business, home, or restaurant look unique, but you’re also promoting recycling. 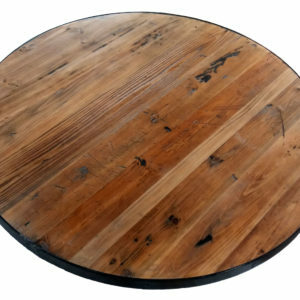 Choose from straight plank reclaimed wood table tops or round reclaimed wood table tops. For smaller restaurants or bars, round reclaimed wood tabletops are perfect for maximizing the space and comfort of guests. Rectangular table tops like our straight plank table tops are ideal for larger restaurants, stores, dining areas, or bars, as they can seat large groups of guests. Straight plank table tops are ideal for a more natural look. Round reclaimed table tops with a metal edge strapping and all of our reclaimed wood tops come with a water-based urethane Matte finish. When you order from RCSuppliesOnline.com, you will experience a shorter turnaround, faster delivery, a higher-quality product, and an unbeatable price. If you have any questions about our tabletops, would like to check the status of your order, or need assistance placing an order, don’t hesitate to call our toll-free line, (844) CAFE-322 Ext. 1. You can also request assistance from our contact us page. Scroll down the page to browse our collection of reclaimed wood table tops! Reclaimed wood vs. New wood comparison. Attaching the tabletop to a table base.